Suigetsu proceeds to show Sasuke the scroll that he found at Orochimaru’s hideout earlier. After examining its contents, Sasuke’s next motive is to meet with Orochimaru and explained to a confused Suigetsu that he is not one to die so easily as he has Jugo’s assistance in reviving Orochimaru via the Curse Unsealing ability. 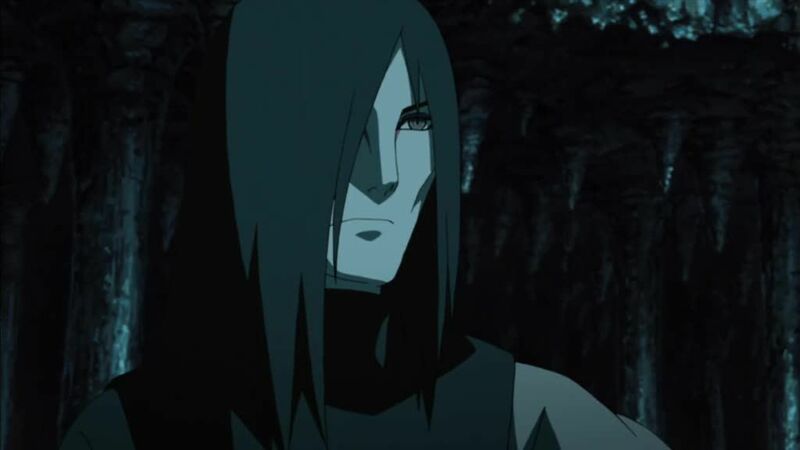 Expressing shock that Sasuke would be the one to resurrect him, stating his intent to still take his body if he was in better condition, Orochimaru asserts that he shows no interest in the war. But when Sasuke then shows Orochimaru the scroll he was given earlier and states he wants to get answers from those who know everything, Orochimaru siphons back his stolen chakra from the immobilized Kabuto while agreeing to guide his former apprentice to the answers he seeks. Elsewhere, Naruto and the others watch on as Tobi moves forward with the revival of the Ten-Tails by revealing its actual body: The Gedo Statue. With Kakashi wondering why Tobi would bluff as the Eight and Nine-Tails’ chakra are still intact, Gyūki notes that Tobi may have got his chakra from the clone he created to cover Killer Bee’s escape from Taka. Kurama also adds that his chakra is present in the treasured tools, which contain the sealed Gold and Silver Brothers, that the Gedo Statue swallowed earlier. Though the allied ninja all agree that its resurrection must be stopped, Tobi declares that even if an incompletely revived Ten Tails would still ensure the achievement of the Infinite Tsukuyomi. As the group rally to fight, Naruto enters his Nine-Tails Chakra Mode and proceeds to attack the statue.